She was at home with my dad. It was about three in the morning when they got to the hospital. The pain would come and go. About four in the afternoon, the pain got worse, and that was when my grandma went to the hospital. About 9 o'clock, The doctor said it was time. I was born on March 25th, 1980. I have cerebral palsy, because the umbilical cord was around my neck 3 times, at the time of my birth. no oxygen was going to my brain. I had to stay at the hospital for 2 weeks, because I had to be on machines. The doctors told my parents, I was not going to live for a long time, or if I did live, I was going to be like a vegetable. They were wrong. Here I am enjoying life. I am very thankful for being here. My mother knew that the doctors were wrong when I was one. One day I was sitting in my high chair, and she said that she was going for my bib. I had my head down when she came back with it because I knew that she had to put it on me. She knew that I was going to be a smart child since then. Having a disability can be hard and sad sometimes. It is hard when you can't do things for yourself. I can't take care of myself. I can't take myself places. It is hard when people think that you are mentally challenged because you are in a wheelchair and can't speak clearly. They have to see that you're smart even though your body doesn't cooperate. They have to giveus a chance to be somebody in this world. But I don't get sad that I have cerebral palsy. I know that God picked me to have adisability. He never leaves me. He has blessed me with a really beautiful family and wonderful friends. I enjoy life! They shouldn't raise their voice to talk to you because you can hear very well. They shouldn't treat you like a baby because you're disabled. You're a person like them! They should teach their children how to be around people with disabilities so they can have no fear for them. All of these things have happened to me. We have to change them. Life can be sad for me sometimes. Sometimes I wish that I could just hop on an airplane to visit my friends. I wish I could see my friends who don't live near once a year. I didn't go to the dances from high school because nobody asked me to go out with them. I just went to a basketball game with a guy, and that was fun for me. Of course, I wanted to go to all of the games from high school, but I couldn't. I don't get to go out with my friends as often as I would like to. I could go out every weekend if I could take care of myself. Thinking about these things makes me sad sometimes. I don't give up on life because it can be beautiful. I am happy knowing that God might keep giving me a lot more wonderful times with my family and friends. Getting letters from my friends keeps me happy. I have a really lovely time when I am with my loved ones. My dad was caught in Texas and Colorado for being here without papers. He worked in those parts for three months a time before he would get caught. 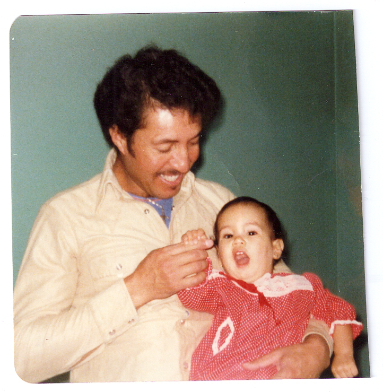 When he was in Colorado, he was taken back to Mexico by plane, and that was his first airplan ride. One time, he came on foot and that took a day and a half. There was another time he tried to cross some people over, but he was caught.. He was put in jail for that in Mexico. My dad says he came to make money. He wanted to send money to his parents. He wanted a good job. My grandmother had red hair and green eyes. She lost her mother when she was 10 years. She and her brother then went to live with their aunt. Their father remarried and had 3 more children. When my grandmothere was a girl, she played a trick on my uncle, her brother. She came home with groceries and her brother saw she bought some cheese and said he wanted some. She told him she would let him have a bite but he had to close his eyes. She told him to keep his eyes closed and when she told him to, to bite down hard on the cheese. She put it in his mouth and told him to take a hard bite. When he did, he bit into a bar of soap. I have been told my grandma would also brush my hair. She would take care of me when my mom was at work. She was the only one who could me smile when I was a baby. All I remember about my grandma was when she was sick. One time, I was in her kitchen when I heard her yelling at my mom. She yelled out "Lupe, I think I used the bathroom in my clothes". I remember I got scared because the phone kept ringing at the same time. My mom says my grandma made it to the bathroom to use it. She just lost water when she yelled out. Second time at home I remember was when she was talking to her best friend on the phone. She was wearing a green bandana on her head. She was sitting down on the couch. I remember I wanted to talk to her best friend too. The last time at home I remember, I had to visit her room because she was laying down. She kept smiling at me. During one of those times, my dad was feeding in her kitchen, and I remember getting so mad because I wanted my grandma to feed me but she was already too sick. I remember three hospital visits. One time, my grandma was sitting up in bed and she looked good to me. Another time, she was asleep and my dad held me close to her face so that I could give her a kiss. The last time, I got really scared when I saw my grandma. My dad says I got scared because I didn't see her for a few days and she got thiner. But I remember her crying, shaking her head no, and my grandpa had his arm around her neck. My dad took me to the waiting room because I was crying so much. I kind of remember my mom getting that call but she didn't tell me anything.. I was outside sitting on our poach. The next thing I remember was that my dad, my mom and I were at my babysitter's apartment. My dad got on his knees by me, and he told me that my grandma had gone to heaven. I just cried. He had to carry me back to our apartment because I was crying so much. She passed away on Jan. 3rd 1984. I loved her so much and she is my angel forever. I had to start going to the Rehab Center when my grandma got sick. I learned English there. My parents talked to me in Spanish at home. It was easy learning English. I got my therapy at the center. The therapist put me in the water and on a swing. That was fun for me. I made friends there. I made a best friend and her name was Tina. She was sweet. She used to hold my hand. I also met my friend Mark there, and I will talk about him a lot because we saw each other grown-up. I made another friend there, and her name was Desi. All of us used to play together. Mark was in a wheelchair. Desi used a walker. Tina was fine. She got sick because she got cancer. Maybe that was why she went to the center knowing that she was going to get sick, but I don't know. I remember I started the Rehab Center before my grandma passed away because I remember her going with my aunt to pick me up. During the time my grandma got sick, we met an older lady who lived in the same apartments as we did. She was from Cuba. She became my babysitter. She was my tooth fairly because she would pull my teeth when they were lose. We would sit outside on her pouch, every time we saw an airplaine go by, she would tell me "some day we are going to go to Cuba on an airplaine." She would help me go #2. I loved her as my third grandma. She was a pure angel during her time here on earth that today I am sure she is really near to our Lord Jesus Christ. February of 1984, my mom got pregant again. Everybody told my parents I would be jealous of the baby. Boy, they were so very wrong!!!!! I was so happy I was going to have a baby sister or a brother that I made sure that my mom took care of herself each day. My cousin came from Mexico to stay with me for when my mom had to go in the hospital. On Nov. 3rd, my sister was born. My dad called me from the hospital to say she was here. The next day, he took me to see my mom and sister. I kissed my sister on her head with a lot of hair... My dad tells me that he was scared she was going to be born with a disability and he was so happy to hear her little cry when they took her out. Tina has been a blessing to me. I had a really playful childhood. We lived in an apartment complex. My dad had his sister and her family living there. He had two of his cousins and their families living there, too. I grew up with my cousins, and I was very lucky. We played together. We played ball and house. There was an older girl that used to take care of us. She used to take us to the little playground. I liked getting on a big plate that went around and around. That was fun. My aunt took her girls and me to the playground sometimes. My aunt used to get me on the swing with her, and it was fun. She used to take care of me while my parents were at work. She's one of my favorite aunts. Her oldest daughter is my favorite cousin. Sandra and I are really close! We are the same age. My dads cousin used to take care of me, too. I got close to her girls. They were older than me. They played with me. The best part was when my cousins, Yoly and Lili came from Mexico. They used to swing us by our arms and legs. They used to swing us high. That was fun! They played with us all day. My uncle moved here for a few years, and he used to play around with us. He was a fun uncle and still is! 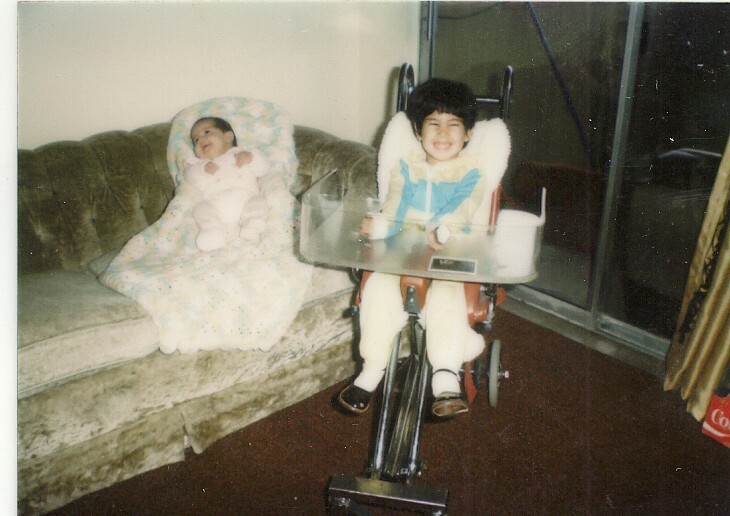 I was very lucky that my cousins played with me even though I was disabled. I was a really happy child! We had to move out of the apartments when I was six. My aunt and her family moved to another city. That wasn't hard because my dad used to take us to see our family often. My cousins and I used to play still. They had a big yard to play. All my mother’s relatives are very nice. They aren’t rich but not too poor but do struggle. They are always very happy. The streets are very narrow and the houses are all attached. People walk a lot. Parral is a small town with lots of autos, smog, noise from auto horns & old buses, the train. Different smells like of burnt tamal leaves in some places and the smell of shoe polish in the plazas. Also different was how a man with a megaphone(?) on his truck would announce what vegetables he was selling as he drove down the street. I liked the sound we heard from an old mine to announce noon time. The first time my mother’s family threw a party for me I was 3. What made it so much fun was having a piñata which my mother has never used. My aunts and cousins made the piñata in the shape of an elephant. The food served was enchiladas because they’re my mom’s favorite. They also had guacamole tostadas and beans for me. The music came from cassettes played on the stereo, mostly "Mexican tropical" that sounds like Cuban salsa but is a little different. My uncle also sang to me playing the guitar. I had a lot of fun and laughed a lot with my cousins: Judith (pronounced You-DEET), Araceli, Rocio, Felipe, Tono (Tonyo), Miguel Angel (called Ata), Omar, Victor, & Saul (Saw-OOL). They would throw me the ball and I would kick it back to them. When I would play basketball with the boys, my cousin, Omar, and I would go way across from the basket was. From there, he would give me the ball to hold until we got to the basket so he could throw it in. Sometimes, we would make it to the basket and sometimes the other boys would take the ball away from me so they could make a point. My girl cousins and I would make food out of leaves and dirt. On the last night before we would come home from Mexico, my family would always get together. I remember one night at my uncle's house. My cousins, Tina and I made a train with everybody holding on to each other.. I was the front of the train. We ran through the kitchen, the living room and back outside. There were 12 of us. Although I sometimes wish I was living in Mexico, I know I am better off living here. Mexico is barely helping people who have a disability.. Each state does not have a rehab place. Families have to go far so their children can get therapy.. I do not think Mexico has help for grown-ups who have a disability like we have here. My first day of school was a little scary for me. My parents must have taken me on the first day because there was another Mexican family who they met. The first day on the bus was not good because I just cried and cried for my dad and my tio. I kind of remember the bus would sometimes pick me in front of my aunt's apartment. I really liked the teacher. I just remember her teaching us numbers and food names. At recess, sometimes she would put me on my belly and that is how I would play in the sand boxes. When she did not do that, I'd visit with my older friends outside which I enjoyed. I didn't like nap time because I could not sleep. After that time, we played with dolls and a doll house. I didn't like my PT, Tim, because he would make me keep my feet down on my footrest. For that Hallween, my mom dressed me as a Mexican girl. When I was in kindergarten, I used only a board that had pictures on it, to talk with. I pointed to the pictures with my eyes, and someone had to guess what I was saying. That was very difficult. I really enjoyed first grade. My teacher was really tall. I liked her a lot. She taught the whole class at the same time. We had a Spanish teacher who would go in one day a week to teach us Spanish, but I already knew what she was teaching. I started to learn how to go to the john. I didn't like the school bathroom chair because it would hurt my bottom. In the way back of my mind, I remember a lady with white hair going in to read to me. My SLP taught my parents when I looked up, it would mean I was saying "I don't know". I started to use a computer to learn how to spell. They were outlines of words and when I pressed the right letter, the word would start coloring in. I got Student of the Month a few times. My parents wanted to live together. Her parents said no. They said they had to get married to live together. After 3 years of being married to my dad, my mom wanted out. For being Catholic, she tried to make it work for 6 more years. My dad had a problem giving us money always. After three years of being married, one day my mom found money that he was saving for animals and land in Mexico. My mom got so mad that she used that money to pay bills. At the end, he would not buy groceries. My dad never went out on my mom or hit her. His dream about going back to Mexico was the problem. After my parents got divorced, my mom went to clean houses to put food on the table. One day a house she was cleaning, the lady came home so happy because she got an A on her collage test. That made my mom want to go back to school. answers on little pieces of paper and she would put them where I could see them. We got to learn about the sun and about the stars. Sometimes when we did not have school, my mom wouldhave to take us to the university with her. She worked in the music department and then at the Spanish department where shetaught. In 1995, she got her bachelor's degree in criminology. I still remember that day well. My mom was wearing a blueand green dress with her red grown over. She was one of the ones who got to speak to the other people getting degrees. There, I was being proud of my mom. It took another three years for her to get her Master’s in South West Hispanic Studies. She wanted to get that degree in the mail so she did. Life is funny sometimes. During the eight years that she was going to college, we were waiting to get on the DD WAIVER. The same month she took her master’s expand, we were accepted to be on the waiver.The DD WAIVER is a state program that allows families to keep their family members who have a disability at home instead of putting them in a group home. My mom gets paid for taking care of me. I really love living at home with my mom because she is the best caregiver for me.My mom always has been more supportive of me than my dad.. She raised us up by herself. She always went to my meetings at school. She helped me with my homework when I didn't have a caregiver. When my sister was 3, every night my mom would sit with us and read to us. Tonya, Of course I remember. You retained just about everything. The first form of communication was the picture board. You had different pictures per category. I pointed to each category first, then to each picture until the correct one was pointed out by you. On your lite talker, we programmed greetings and questions for you to communicate with the other kids or for your needs. Do you remember We are having a pancake pajama party, would you like to come? I think you wore that one out. In the first grade we used the kids a lot, to help you, they used to say Tonya wants the blue one or I think Tonya means the other one until we figured out what it was that you were trying to say. The most important was the integration time. The kids always wanted to be your friend, is this boy friendly or is he shy? If he is shy it is extremely important that he has a friend who is NOT shy. I really think you being around the other kids was the best learning tool. When you shared reading books with kids, you loved it. When a teacher addressed you for an answer you glowed.